I created the process in May 2008, when I was designing custom elearning for corporate clients (here’s the first blog post about it). The following slideshow gives a simplified, very high-level overview. It uses lighthearted stock photos from 2008 of a guy dressed in a ninja outfit. No political statement is intended. 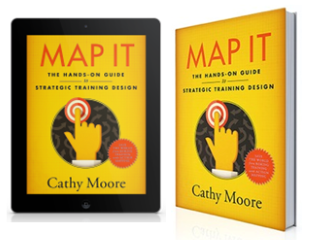 Because I was designing elearning at the time, I presented action mapping as an elearning design model, but it works for all types of business training, as I show in my workshops. In May 2013, I deepened step 2 to include the use of a flowchart that helps identify lean, in-the-workflow solutions, such as job aids or process improvements. Training is rarely the best or only solution to a problem. The stakeholders “get it” right away — it’s an intuitive process and the benefits are easy to see. Subject matter experts who are included in the process are less likely to add extraneous information. The resulting training is likely to be rich with scenarios, which learners often prefer over information presentations. We’re not held accountable for what we do because almost nothing we do is measured. As a result, our work isn’t seen as vital to the organization. By putting a measurable business goal — a high-level evaluation — first and making it the center of everything we do, we publicly commit to improving our organization’s performance and demonstrate our value. Almost everyone has been taught through a lifetime of traditional schooling that “teaching” means “presenting information.” We needed a strong, graphic model to help us see a different approach. Many projects have multiple stakeholders who want to toss in their favorite information. We needed a way to set boundaries and define what was truly necessary. 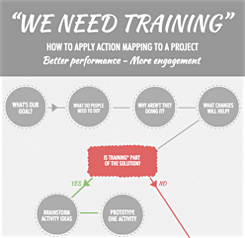 Action mapping is increasingly being presented at conferences or taught within big organizations. A few misunderstandings or misrepresentations have come up. Below are some clarifications. 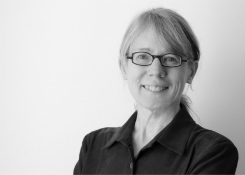 It’s a collaborative process — the designer doesn’t create the map on their own. Action mapping works far better if the client and subject matter expert are included from the very beginning. Both should definitely be included when setting the goal, and the SME at least should be included in identifying what people need to do and why they aren’t doing it. No designer should create a design in isolation. You should make sure training is really part of the solution. People were skipping this aspect of step 2, which is why I added the handy flowchart. 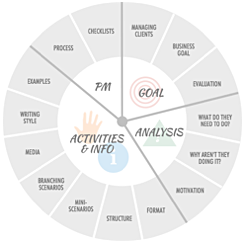 Action mapping includes needs analysis; it’s not just a way to organize content. Unfortunately, some people have presented the system as a way to design activities based on content from the client, skipping the analysis. Action mapping isn’t intended for use in academia. I created action mapping for the corporate world, where it’s relatively easy to set a measurable goal and to analyze what people need to do on the job to reach that goal. The process focuses on observable, measurable behaviors, not knowledge, and it assumes that you have people currently doing the job who you can talk to and observe. It’s usually not a super-simple diagram. The map gets as complicated as you need it to get. For example, it’s common to list major actions you want people to take on the job and then break them down into sub-action that branch off the major ones. The map shown here is the one I used to design my scenario design course. It’s not a mind map. You don’t just add stuff as you think of it. 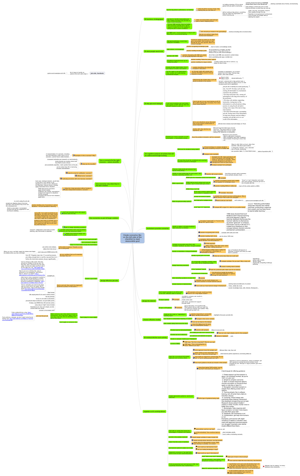 An action map looks like a mind map, but the links between each item create dependencies. Everything on the map has to justify its existence by linking directly to the business goal. The purpose of the map is to prevent the casual adding of content.